High Strangeness: Cindy Lou Who? "Not real sure if it was a dream or it was real but it sure felt real and I have lived with it all my life. We owned a farm in Bxxxxxxxx County Md. on Rxxxxxx Rd. It was about 18 acres or so. The incident took place late at night not sure of the exact time but everyone was asleep in the house. All that I can remember is that it was a very clear night,with a few white puffy clouds.I was standing outside of the back of the house looking up dont remember even going outside of the house the memory starts with me looking up at i guess what some would call a cigar shaped craft." 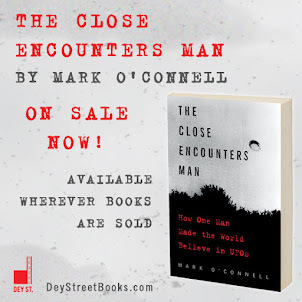 "The craft was tipped to its side and a person was standing toward the front of the craft waving .I remember that person looking just like we do as far as human features and wearing a jump suit kind of clothing. The whole incident didn't last long at all and as he was waving the craft leveled up and just casually drifted away and as that craft left I looked up and seen high up in the sky several crafts going all kinds of speeds none were super fast they were all cruising different moderate speeds." 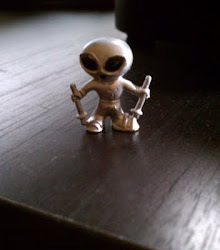 Another authentic touch: this took place back in the day when UFO occupants wore jumpsuits! They didn't show up naked and ready to party back in 1980 ("Alien Evolution," 11/27/2011), and I doubt very much that this person would have been aware of that. Of course I like the fact that the waving alien seems to have known that this person would be standing outside the back of his or her house at just that moment, looking up... It all seems very benign, with perhaps just a hint of creepiness. But what are we to make of the fact that this friendly, waving, human-like, jumpsuit-wearing alien is revealed to be part of an armada of huge ships passing by in the night sky? It's a jarring detail that makes me wonder what those aliens are really up to. 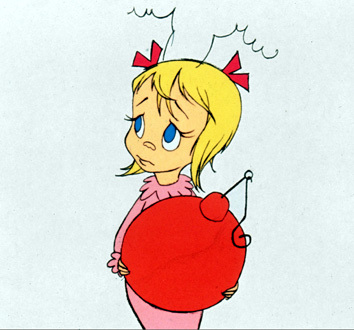 Little Cindy Lou Who, lulled into a false sense of security by an evil alien. "After that I just went in and went back to sleep. Its a dream that has stayed with me since I was child. I dont know how I got outside I wasn't scared or nothing like that .It actually was a very peaceful feeling .I think it happened in the summer because it was a very warm night out. I do remember going inside and just going to bed like nothing happened. It was a weird experience but a peaceful one." Uh-huh. That's exactly what Cindy Lou Who would have said. And we know how right she was.